Are there any broken places in your heart and life right now? I know how hard that can be. Are there any broken places in your heart and life right now? I know how hard that can be. And there’s this wonderful Christian story I could tell you. 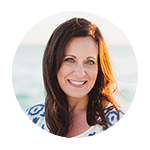 It’s the one about how we can pick up the broken pieces, glue them back together and then let God’s light shine through our cracks. That’s a beautiful story. But what about those times when things aren’t just broken … but shattered beyond repair? Shattered to the point of dust. At least when things are broken, there’s some hope you can glue the pieces back together. But what if there aren’t even pieces to pick up in front of you? It’s hard to hold dust. What was once something so very precious is now reduced to nothing but weightless powder even the slightest wind could carry away. We feel desperately hopeless. Dust begs us to believe the promises of God no longer apply to us. That the reach of God falls just short of where we are. And that the hope of God has been snuffed out by the consuming darkness all around us. Over the past few years, I have been walking through my own season of dust. And if we could sit together over coffee, I imagine you would have some kind of shattered dust story to share with me, too. We are alike in that way. We’re united with our tears, even if our circumstances are different. We’re also united in our desire for God to fix it all. Edit this story so it has a different ending. Repair this heartbreaking reality. But what if fixing, editing and repairing isn’t at all what God has in mind for us in this shattering? What if, this time, God desires to make something completely brand-new? Right now. On this side of eternity. No matter how impossible our circumstances may seem. You see, dust is the exact ingredient God loves to use. We think the shattering in our lives could not possibly be for any good. But what if shattering is the only way to get dust back to its basic form so something new can be made? We can see dust as a result of an unfair breaking. Or, we can see dust as a crucial ingredient. Think about a plain piece of ice. If ice stays in a cube, it’s always just a square of ice. But if the ice melts, it can be poured into a beautiful form to reshape it when it’s frozen again. Dust is much the same; it’s the basic ingredient with such great potential for new life. Of all the things God could have used to make man, He chose to use dust. “Then the LORD God formed a man from the dust of the ground and breathed into his nostrils the breath of life, and the man became a living being” (Genesis 2:7, NIV). Jesus used the dust of the ground to restore a man’s sight. Jesus said, “‘While I am in the world, I am the light of the world.’ After saying this, he spit on the ground, made some mud with the saliva, and put it on the man’s eyes” (John 9:5-6, NIV). And after the man washed in the pool of Siloam, he went home seeing. And, when mixed with water, dust becomes clay. Clay, when placed in the potter’s hands, can be formed into anything the potter dreams up! “Yet You, LORD, are our Father. We are the clay, you are the potter; we are all the work of your hand” (Isaiah 64:8). “He said, ‘Can I not do with you, Israel, as this potter does?’ declares the LORD. ‘Like clay in the hand of the potter, so are you in my hand, Israel’” (Jeremiah 18:6, NIV). Oh, how I love and need the hope God has tucked into these verses. Dust doesn’t have to signify the end. Dust is often what must be present for the new to begin. I don’t know what hard realities have left you feeling shattered, friend. But I do know this: We can trust our God. We can trust Him with our dust. Our greatest disappointments and disillusionments — things that shake us and break us and make us wonder about everything — don’t have to mean all hope is lost. We can place our lives fully in the hands of the Potter. We can dare to believe He is making something glorious out of dust, out of us. Father, I confess I don’t like this — I don’t like dust. But I’m reminding my soul that dust is one of Your favorite ingredients to use when making something new. And I’m choosing to believe You are working right now to do this very thing in my life. In Jesus’ Name, Amen. People say it all the time: “God won’t give you more than you can handle.” But what about when He actually does? 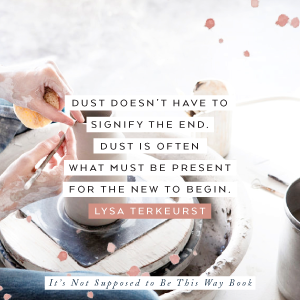 Discover the secret of being steadfast and not panicking when God gives you more than can possibly bear, with Lysa TerKeurst’s newest book, It’s Not Supposed to Be This Way. Pre-order your copy here today, and get the first three chapters immediately! Are there any places in your life that feel shattered to dust? Where are you hoping for a new beginning? Join in the conversation here.